Whilst Messi and Xavi stole the show in adidas with Iniesta on a par in Nike, let’s not forget that the opening goal of the Champions League final and the moment that rocked Manchester United back on their heels, was scored by Samuel Eto’o in new Puma v1.08’s. 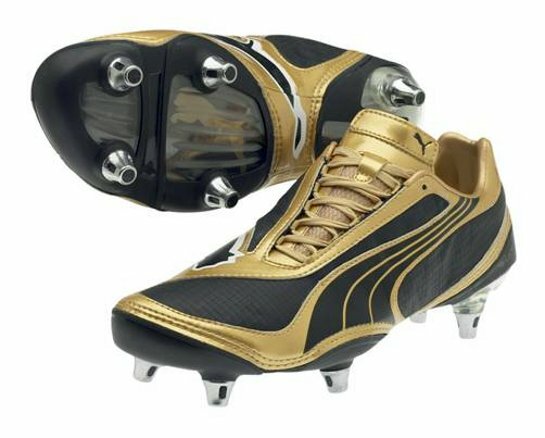 The new boots, which are in a Black / Team Gold colourway are currently available on pre-order and are thought to be hitting the stores in the first week of June at a price of around £115 to £125. The v1.08 focuses on velocity and engineered performance solutions for players on the move with minimalist design which is purposeful and striking. The v1.08 has the sole goal of getting the player to the ball even faster. It certainly worked for Eto’o in Rome as he left Vidic for dead before shooting home and it’s worth noting that the English Premier League’s top scorer for 2008 / 09 Nicolas Anelka, no slouch himself, has also been sporting the boot this past season. Technical attributes include a lightweight textile upper with a microfiber reinforcement, Puma AptoLast for a glove-like fit, UNI technology and a two-piece split outsole that further reduces the weight whilst also enhancing the overall fit. Nice goal – nice boots.